Multimedia Services offers technical support at all three NSCAD University campuses and is part of the new NSCAD University Learning Commons. Support provided by Multimedia Services staff include but are not limited to: help desk support; setup, support and maintenance of student-computing labs and smart classrooms; open access print manager support and printer supply and quality monitoring; general audio-visual resources and loans; recording and editing of NSCAD public events and special events support. Multimedia Staff also aim to provide first response technical support whenever possible, with minimal disruption to core services. 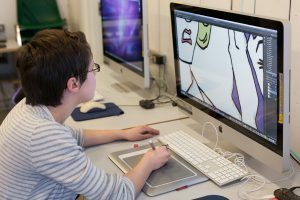 Members of the NSCAD community can reference the Multimedia Brightspace page or Multimedia help site for additional resource information.